Two colleagues and friends of Lifetime Achievement Award winner Bill Connolly offer their thoughts on what the retired senior editor at The New York Times has meant to ACES and to copy editors everywhere. Bill Connolly presents his "Jimmy's World" session April 14 at the 2012 ACES conference in New Orleans. Tonight, we’re giving a special lifetime award to one of the most beloved, passionate, supportive and straightforward people most of us have ever had the honor to know. Most of you won’t recognize him in these pictures without his beard, or without the playful look in his eyes (or on his nose), but there he is – Bill Connolly. Bill is stepping down from the ACES board, where he has been every day since this organization was born in Chapel Hill in 1997. Luckily for us, Bill is staying on the Education Fund board, and he will continue to advise the ACES board. So we’re not saying goodbye, just thanks. There’s not a copy editor in this room who has not been touched by Bill’s influence, directly or indirectly. If you’ve attended ACES before, maybe you were riveted by his “Jimmy’s World” session, where he illuminates so well how a sharp-eyed copy editor – or any skeptic – could have saved the Washington Post the embarrassment and returned Pulitzer that resulted from a reporter’s fabrication. Maybe you took away some advice on resumes, or internships, or on how to write a stylebook. (On that, he should know – he spent four years in a soundproof room revising the New York Times Manual of Style and Usage.) Maybe you were one of the hundreds of journalists he trained in 20 summers at the Maynard Institute for Journalism Education. Maybe he recruited you, or tried to recruit you, in his years as a hiring editor at The New York Times. Maybe one of those people carried some advice, wisdom, or a tip from Bill to you. At the very least, as members or attendees at this conference, you are being governed by bylaws, protected by conflict of interest policies, guided by the rational, measured, intelligent decisions Bill has made for ACES. Rich Holden, the executive director of the Dow Jones News Fund and Bill’s longtime co-conspirator, was supposed to deliver this tribute, but he was unable to come this year. Duty, honor, ACES. These three hallowed words reverently dictate what you ought to be, what you can be, what you will be. Fortunately, our honoree tonight possesses the eloquence of diction, the poetry of imagination and the brilliance of metaphor to tell you that he deserves this honor more than anyone else. The unbelievers will say they are but words, but a slogan, but a flamboyant phrase. Every pedant, every demagogue, every publisher, every reporter, every webmaster will try to downgrade an editor even to the extent of mockery and ridicule. At 20 copy desks, in hundreds of battles with reporters, around a thousand glue pots, our honoree has witnessed that enduring fortitude and that invincible determination which have carved his statue in the hearts of the ACES membership. “It’s probably fair to say that without Bill, there would be no ACES. 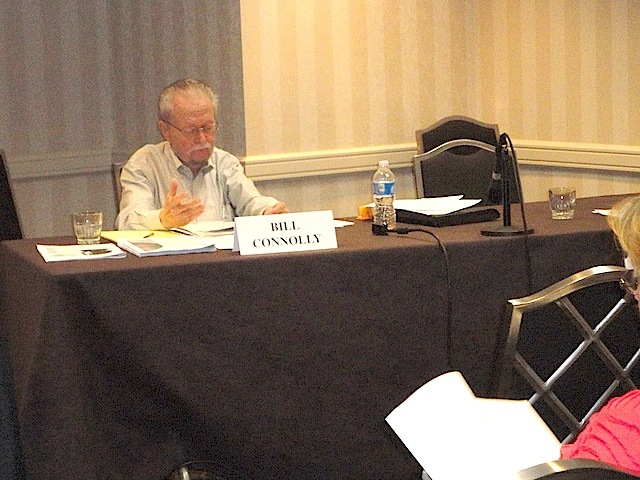 “Bill was the keynote speaker at that very first ACES conference, where he told us that ‘this is a great time to be a copy editor.’ He showed how true that was then, and despite massive economic challenges, his message is still true. “He hasn’t just been a showcase figure,” Chris continued. “He has given quiet, thoughtful, rational guidance as a board member on issues involving personnel, policy, finances, insurance – practical, real-life issues that many of us were ill-suited to address. And when Bill speaks, everyone listens. He has never once raised his voice; when he offers an idea, he offers it quietly and straightforwardly. You know it’s going to be the best one in the room, and you miss hearing it at your peril. As for me, Bill guided me and mentored me, teaching me how to spot talent, nurture it and try to lasso it in to the The New York Times, or keep it happy once it was there. He became and remains a dear friend. His advice has always been right. And his sense of humor has kept me laughing. His favorite punctuation mark is the semicolon, as it is for so many of us. So in support of Bill, please wear the Semicolon Appreciation Society stickers, found on your table, with pride. He’s certainly an idol for many of us. Thank you, Bill. But there are some things that editors can do. They build your basic character. They mold you for future roles as the custodians of the nation’s grammar, punctuation and spelling. They make you strong enough to know when you are weak as you confront an egotistical reporter and brave enough to face yourself when you are afraid of being called to the publisher’s office. The editor’s story is known to all of you. It is the story of the American man (and woman) at work. Our honoree’s estimate of the editor was formed on the copy desk many, many years ago and has never changed. He regarded the editors then as he does now, as one of the world’s noblest figures—not only as one of the finest newspaper characters, but also as one of the most ink stained. At 20 copydesks, in hundreds of battles with reporters, around a thousand glue pots, our honoree has witnessed that enduring fortitude and that invincible determination which have carved his statue in the hearts of the ACES membership. He didn’t know the dignity of their birth, but he did know the glory of their retirement. They retired (or were bought out or laid off) unquestioning, uncomplaining—well, at least in some cases—with faith in their hearts and on their lips the hope that their newspapers would survive. Duty, honor, ACES. Always their blood, and sweat and tears as they saw the way to making their deadlines. Their resolute and determined defense of the language, their swift and sure attack on self-important blowhards, their indomitable purpose, their complete and decisive victory—always victory, always through the smoky haze of their last reverberating headline, the vision of gaunt, ghastly men and women who had to skip dinner reverently following the password: Duty, honor, ACES. And through all this welter of change and development in our profession, the mission of an editor remains fixed, determined, inviolable. To improve copy. Everything else in your professional career is but corollary to this vital dedication. The long bowtied-green eyeshaded, suspender-wearing line has never failed us. Were any of you in the audience to do so, a million ghosts of editors past would rise from their unemployment lines thundering those magic words—Duty, honor, ACES. The shadows are lengthening for our honoree. The twilight is here and his days of old have vanished. But in his dreams he hears again the pounding of typewriters, the strange, mournful mutter of the copy desk. And in the evening of his memory, he comes back to the desk. Always there echoes and re-echoes Duty, honor, ACES. Tonight marks his final roll call — well, maybe not, but he’s getting there. And I know I speak for him when I say that as he crosses the river, his last conscious thoughts will be of ACES, and ACES, and ACES. Our honoree, Bill Connolly, will now bid us farewell.